I won the third quarter of 2018 tournament at the Japanese go club that I belong to, the South Bay Ki-in, located in the New Gardena Hotel, 1641 W. Redondo Beach Blvd., Gardena, CA 90247; (310) 327-5757. I am now ranked as 5 dan. Last year the ranking of most of the players in the club were revised lower in order to wring out the inflation that had supposedly crept in. My rank was revised from 6 dan to 3 dan. It has taken me all of this year so far to crawl back up. I am hoping that my results in the tournament this quarter will enable me to get back to 6 dan. I am now ranked third in the club, just a few points below two other players. Anyway, I mention all this because I want to explain my qualifications for annotating the games below. They are from the 43rd Annual Meijin Title match being contested by Iyama Yuta, Meijin and Cho U 9 dan. These have just been played, starting with Game 1 on August 28. I suppose that I could get access to the commentary online, either at the website of the Nihon Ki-in or that of the sponsoring newspaper, the Asahi. Actually, on the Saturdays when I go to my Japanese go club, I go upstairs to the lobby of the hotel and read the Asahi newspaper. The go column in that newspaper is now presenting the games of the match, but they are typically offered in a dozen or so segments. I cannot see more than a couple of segments every week. Those columns also offer the analysis of top professional players. That can involve very complex variations. I still do not have the capability to reproduce such complex material. Therefore, I will just give my thoughts in a general way about the games. One other thing about analysis. I met Kobayashi Chizu years ago and asked her about a variation in a go magazine. She replied, "I never read the go analysis in magazines. I prefer to play out games on a board and come to my own conclusions." However, she was a top professional woman champion, stronger than 90% of the go players in the world. 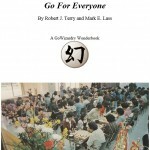 I think that more go players can relate to my approach to the game. The image at the top of this posting is that of a poster signed by Iyama himself. It hangs on a wall of my Japanese go club. The kanji there read, 研道 = Kendou = Study Path. A simplified explanation is the following. One meaning of 研, or Ken, is "research" or "investigation." 道, or Dou, is "path" or "road" or "way." (The classic Federico Fellini movie, "La Strada," has the same title, "The Road.") However, in Chinese this kanji is pronounced, "Tao." That goes back to the ancient "I Ching." 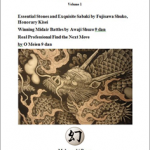 Many other Japanese pursuits use this same word, most recognizable is probably 柔道, or judo. This is literally the "Way of Flexibility." This gives some feeling of the nuances of what might seem to be a simple piece of calligraphy. With that as an introduction, here are my thoughts about the first game of the current Meijin title match. Played on August 7 & 8, 2018. 239 moves. Black wins by resignation. White 2 and 4 are played on the star points, meaning that their power is directed towards the center of the board. Black counters with the move at 5, which aggressively directs its power in the same way. White answers with the common joseki of 6 through 12, again developing in such a way as to exert control on the center of the board. Black 13, invading at the 3-3 point is surprising. It seems to cede some influence in the center to White while taking profit. But this is why top professional go players spend so much time pondering their moves in the beginning of games. It is not unusual for them to devote an hour or more thinking about a single move. White 16 deviates from typical joseki variations. Cho U might have researched this in the past, either alone or with a group of colleagues or students. But the only way to get a true assessment of a position is over the board against a strong opponent. With the moves through White 30, there is a present-day exchange of territory for influence. Which side came out better? Impossible to say at this point. What is clear is that the move of Black 29 cuts White’s two groups apart. It occupies a vital point. It can be captured in a ladder, but Black can make a ladder breaker at some time. That represents a threat to White’s three stones below (18, 2 and 14). Therefore, Black maintains the initiative in this position. Black 31 is another aggressive move. The average go player would probably extend out at 32. However, that would let White jump out at 34. Then the opponents would fight things out in the center on more or less even terms. The attachment of Black 35 occupies another vital point. I am surprised that so many players fail to realize that this point is the vulnerable one against White’s three stones to the left. The one point jump of Black 37 is another surprising move. It is as aggressive as the earlier moves, but it is thin, with defects (bad aji) that can be exploited. The question is what is the best way to take advantage of that. White 32 puts Black stone in a ladder, but because of Black’s stone at 31, the ladder does not work. This explains why Black made the move to begin with. But it seems that White has no better move to play. 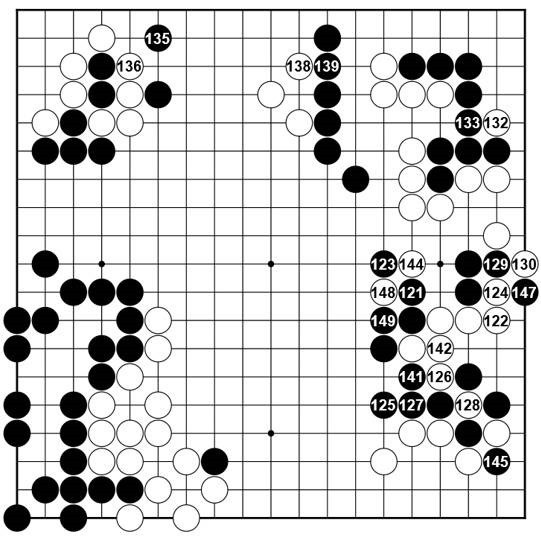 White 44 seeks to attack the defects in Black’s position, and through White 50, a ko develops. 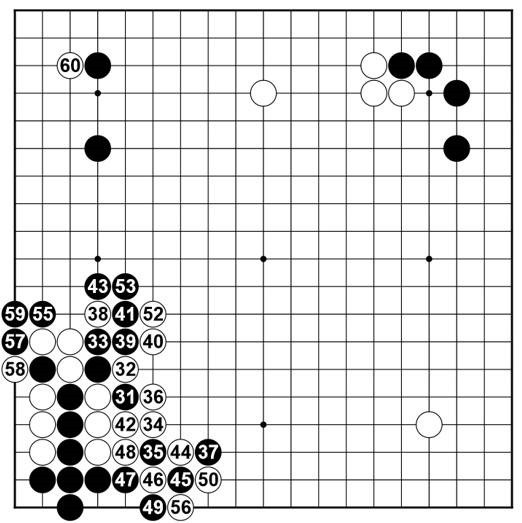 White has an ideal ko threat at 52, but Black 55 is big, too. After White wins the ko with 56, how is the board position to be evaluated? Two other intangibles are the assessment to be made in regards to the full board position. White’s star point stone in the lower right corner is ideally placed, but so is Black’s stone in the upper left. They illustrate another go proverb, "Do not play too close to thickness." So this is equal, too. The second intangible is White’s thin position on the upper side. At this point in the game both players must have been calculating the most advantageous way to handle that situation, i.e., the correct point for Black to invade and White’s response. Black had the initiative to begin with, and if the position has not changed from a whole board perspective has not changed, Black is still leading. That is why White aggressively attacks Black’s upper left corner with the attachment at the 3-3 point with 60. Black 61 is a simple but effective move to build even more thickness on the board. The move gives White no latitude for doing anything but making a small life in the corner. White adds the move at 64 to increase the potential play (aji) in the corner, then turns to the lower left corner to resolve the situation there. White 70 turns the corner into ko. 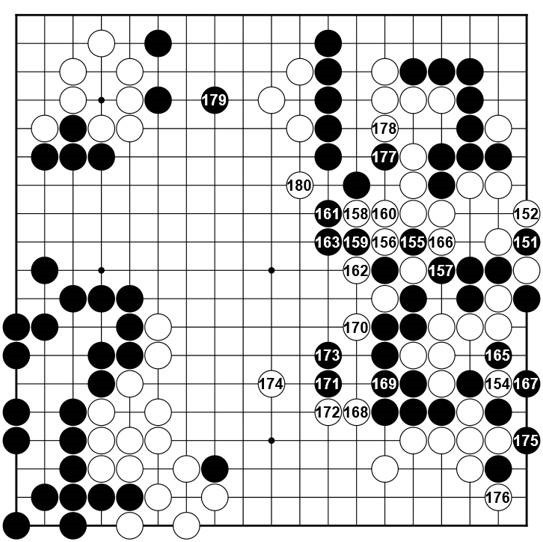 The reader is urged to consider Black’s move of 71 carefully. Many players mishandle ko fights. Black 71 is the most efficient way to play here. Then Black throws in at 73. Does the reader know why Black does this? The fact is that if Black neglects to play here, after capturing at 78, White 73 turns the corner into seki in sente, because Black would have to connect at 78. White 88 is now the best move to make the thickness to the left work effectively. A White move on the star point on the right side in the opening would work effectively, But the play is now well into the middlegame, so that is too small. White has to take solid profit now. Aware of this, Black attacks the corner with 89, aware that this move may be made with impunity. If White made a move on the point to the right of the star point, two points below 89. Black would take a decisive advantage by occupying the star point above in the middle of the right side. White 90 attempts to make the best of a bad situation. The move puts pressure on Black 89 while attempting to develop a territorial framework (moyo) to the left. But Japanese like to say that this move is 中途半端 = Chuto Hanpa = a move that tries to do two things at once and doesn’t do either one effectively. White has too many weaknesses that cannot be fully defended. It is only due to Cho U’s great talent that he has held it together as long as this. Here’s another pop quiz. 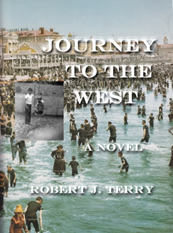 If the reader was playing this game, what is now to be done? Count the board. If the reader is eager to improve, this is the way to do it. Many go players look at counting as a nuisance, but it is essential in order to get strong. Every time one counts, it becomes ore clear how the board position stands. White: Lower side = approximately 70 points; Upper left corner = 15 points; Total = 85 points. Black: Lower left corner and left side = 50 points; Upper right corner = 15 points; Total = 65 points. It might seem that Black is 20 points behind on the board, but again it is the intangibles that play a great role. Black’s moves at 75, 85 and 87 are powerfully placed. On their own, they are worth at least 20 points. They represent thickness and at some point that thickness will be converted to territory. Black 91 attacks slowly. It builds up power inexorably, a lot like Rin Kaiho did many years ago. I wonder if Iyama got a hint from playing through Rin’s games. The attachment of White 92 is an aggressive move in response. Both players are continuing to display fighting spirit, not giving an inch. Black makes the forcing move at 93 to take sente here (and this move is easy to make since Black has a strong position here with the stone of Black 91 in place). The Black starts a ko fight with 95 through 99. So this is what Iyama decided was the best way to play to maintain the advantage. White cannot resist here because the group above is in too precarious a position. So Black gets to make the second move at 113. 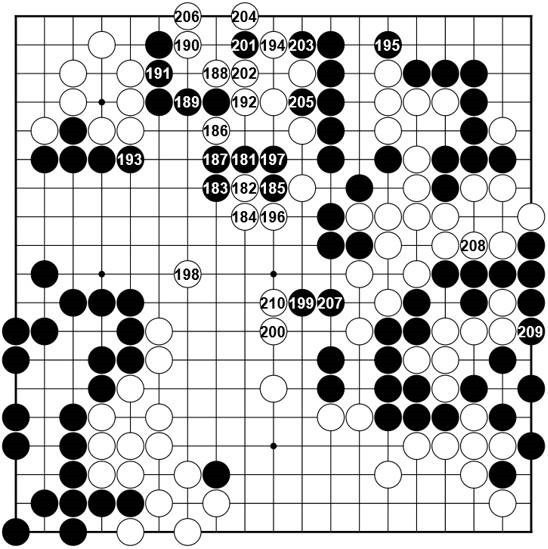 Note that Black’s two stone at 111 and 113 serve to neutralize White’s territorial framework (moyo) on the lower side. White 116 is played in order to seek complications. However, Black is in no mood to compromise. Black 117 attacks all-out. White defends with 118, desperately trying to make shape for the stones here. Black butts against White’s stone with 119 and White does the same with 120 against Black 111. The fighting is getting impossibly convoluted. Black keeps up the pressure with 121. White is given no respite. Nonetheless, the ko in the lower right corner gives White reason to hope. The descending move of White 122 not only threatens to connect with the White group above, but makes the ko fight below more dangerous for Black. No skin off Black’s nose. 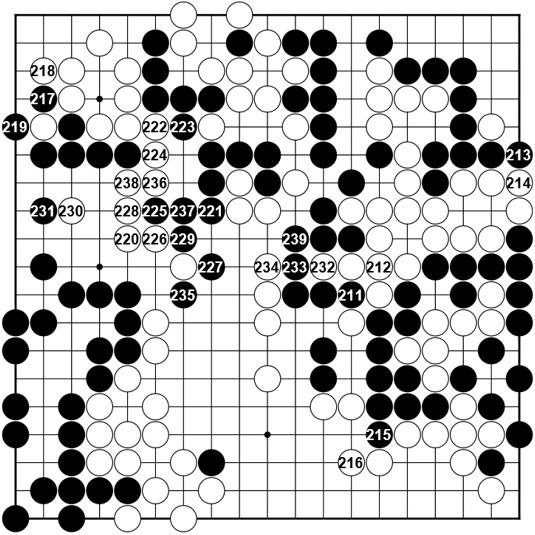 The diagonal move of Black 123 rescues the stones on the right, then, while White connects above with 124, jumping to Black 125 not only keeps all of Black’s stones connected, but further neutralizes White’s territorial framework on the lower side. Black 125 may be considered the winning move. 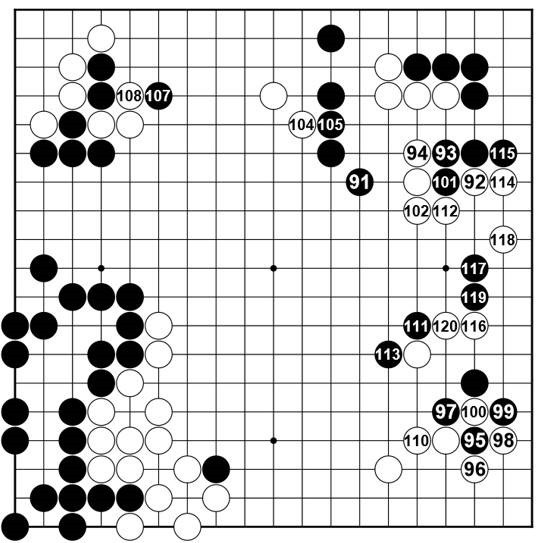 White 126 is a do-or-die move (勝負手 = shoubu-te), staking the outcome on the result of the ko at 128. White 126 forces Black to connect at 127, and then the ko begins in earnest. The essence of this position is shown by how ineffective White 144 is. Black ignores it to cut at 145. This escalates the ko to critical level. Black makes the cutting ko threat of 147, which means that if Black captures at the point above 130, connecting to the corner above and capturing White’s seven stones below are equivalent options. White has no response to this, and throws in 148 as a way to whatever possible from the position. Black goes in for the kill here. The moves from Black 151 through 167 capture seven White stones. This is the resolution of the situation that began when Black attacked the lower right corner with the move at 89. Now Black has a small but significant advantage on the board, regardless of the komi. White attempts to mitigate the damage with the moves 168 through 174, but it is too little, too late. Black just applies more pressure with 179. The game has entered into the endgame phase. There is no more fighting to be done. Black merely has to consolidate the position on the board. For amateurs, things might still seem to be complex, but for professional go players, it is just a mopping-up operation. Does the reader have any questions at this point? If so, can you imagine what my answer would be? I hate to sound like a broken record, but the players in this game must have counted the board many times more than the number of my exhortations. That is just what strong go players do.